Off The Wall Armies is a new collection of old figures, improbable and hilarious. 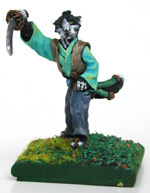 Sculpted in 28mm scale, each set features anthropomorphic animal figures -- sometimes known as "furries" -- with weapons and gear from different historical periods. Theyre great as the foundation of a "furry" campaign, as high-tech bioroids, or just as weird new encounters for adventurers from any time or place. 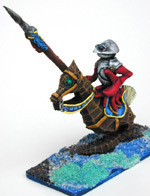 Off The Wall Armies are the delightfully strange creations of Richard Kerr, who sculpted all the figures as well as developed the bizarre universe they come from. Originally released in the mid-80s (and nearly impossible to find since), all the original OTWA figures are coming back -- with dozens of new figures to join the mayhem! 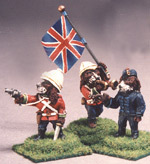 Off The Wall Armies figures can be used in any game that uses miniatures. But Kerr's original game world is too good to leave behind, so background information exclusive to the OTWA world will be set apart from the normal text using boxes like this one. 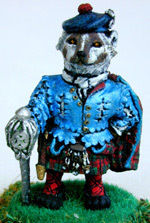 The Highlanders are based on the North American badger, with an odd culture from the 16th thru 18th century Scottish Highlands. 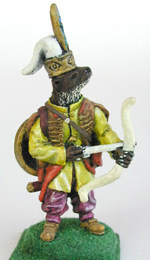 The Otterman Empire is based racially on the Canadian river otter, and culturally on the Ottoman Turks of the 14th thru 17th century. The Semi-Colonials are a collection of races with a common heritage from the British colonial period of the late 19th century. The members of Something Fishy have two things in common - a genetic base of sea creatures, and a cultural base of Renaissance Europe. 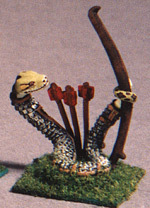 Snakes of Wrath are based on the Anaconda (Eunectes murinus), and are fanatical warriors. Katana Kats follow the codes of feudal Japan, in their own feline way. It's 2445, and humanity has vanished from the planet, wiped out by the cure for the common cold*. The descendants of bio-engineered intelligent life-forms -- mankind's greatest achievement -- have inherited the Earth. These "Artificial Sapients" (called "Arps") were created in the 21st century for various reasons. Some were used as cheap (or even slave) labor, others as workers for special environments, and yet others as "toy people" for the super-rich. They were deliberately crafted as non-human anthropomorphized animals; this helped (for a while) to turn aside slavery charges, and provided the genetic engineers with a strong genetic base upon which to build their subjects. Often, especially for those "races" created for the amusement of the rich, a pseudo-historical culture was developed for the Arps. These pseudocultures were usually primitive and often amusing, since it was felt the public would be less afraid of something they could laugh at. Unlike their masters, the Arps proved almost completely immune to the "cold-cure vaccine," and as the last of the human population aged and died, they gradually expanded their own populations, taking over necessary support roles as the remaining humans grew too old. For the most part, they abandoned human civilization as their numbers dwindled, and pursued their own notions of society, law, and culture. Without a real historical culture of their own, they became fanatically loyal to their adopted pseudocultures, and built their slowly expanding civilizations around them. *The vaccine did, indeed, work. The common cold was finally defeated; it's just that the vaccine had the unfortunate side effect of causing sterility, and the virus that prevented the cold was as contagious as the illness it prevented. Off The Wall Armies is copyright 2013 Gray Cat Castings.